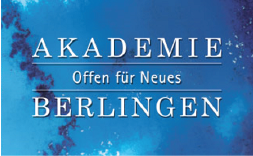 Akademie Berlingen was founded in 1993 by Silvia and René Künzli as „Seniorenakademie Berlingen“ and 2014 renamed Akademie Berlingen. Legally, the Academy is a charitable foundation and as such it does not intend material gain. It is supported by women and men who are involved in volunteer trustees and the board. It is in every respect independent, economically independent, politically and ideologically unbound, and therefore available to all interested people on both sides of the borders, Swiss and German. Akademie Berlingen has access to a huge network of private households (more than 2000 affiliated addresses) with people in the age group 60+. A major role consists in educational activities and active dialogue with various stakeholders on the experience and implications of ageing. Akademie Berlingen maintains extensive relations to local and regional institutions and partner organizations involved in geriatric work, including memory clinics, outpatient services and care homes for people suffering from both cognitive and physical impairments. Akademie Berlingen brings together elderly people from private households for common social activities such as seminars, social trips. It actively supports valuable work devoted to the interests of elderly people such as through reviews, tests, own contests and awards.